1-13-07, Saturday, was my friend Martha's going-away party. She's moving to Kentucky. This is her, holding her new scarf (look familiar?). Sunday, 1-14-07 I had some ladies over in the evening for a hobby night. 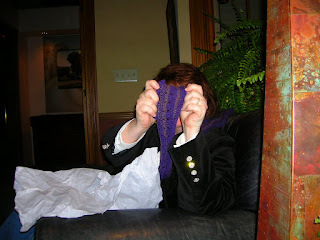 We just sat around, knitting or crocheting and gabbing. It was very nice. I didn't take any pics while they were here, but this is one of the candles I'd lit. 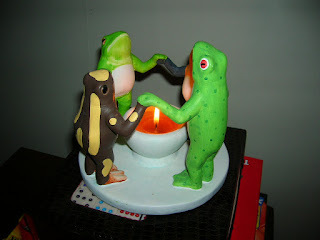 I've always liked this circle of frogs. Luckily we did no frogging that night! 1-15-07 was MLK Day, and this is Simon at the breakfast we went to. See my other blog for a brief overview of that event, if you like. That afternoon we visited friends up in Mt. Vernon, OH. I call it a retreat center - nice house out in the country. 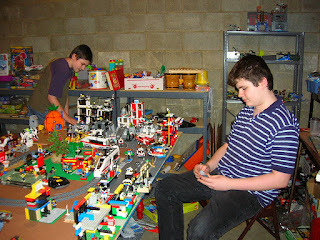 This is the boys' lego city. Obviously, Simon has fun playig with Tim (the elder) and Sam. They've been friends since they were very young and Megan was Simon's fulltime babysitter (I think he was 3). Tuesday, 1-16-07 I spent a good deal of my work day at the Main Library in meetings. 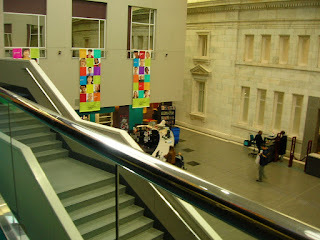 This is a pic of the atrium. You can see the check-outs down there. I'm on the second of three floors taking the pic. I love how the architects incorporated the exterior wall of the original Carnegie building as an interior wall of the updated/expanded building (dedicated in 1990). Since this is supposed to also be my knitting blog, I have this meme for your quizzy pleasure. I should be working out this morning, but I'm going to go back to bed for another hour instead. Blah. wah. the opposite side was the window to my old office. Did I ever tell you about the paper airplanes? One year at the all-staff party a few of us went up to the third floor and threw some expertly folded (ahem!) airplanes off the balcony. One of them landed on the window sill of the big office (Deb was the occupant in those days). We laughed and laughed about that . . . but unfortunately, it was cleared before we opened a few days later. Sigh.